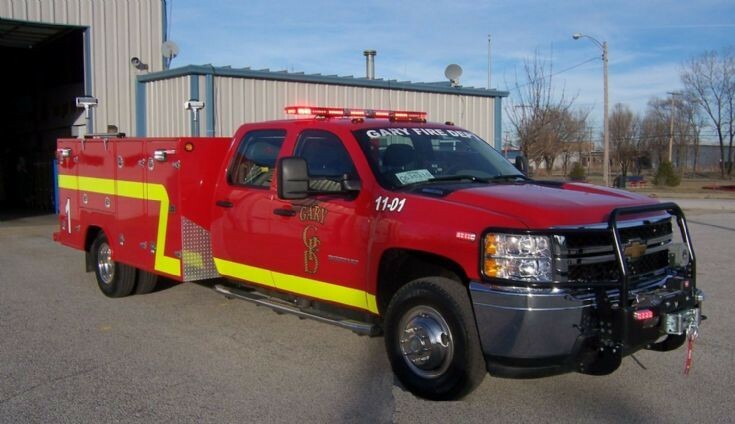 New Squad 2 for the Gary FD. 2011 Chevy/TL Woods, replaces the old Pierce that was retired after an accident in the fall of 2010 and beyond repair. Are Gary moving away from their famous blue over red livery? Added by Andy on 18 January 2012. They aren't didn't paint this blue/red due to budget reasons. Hopefully the next squad will get a paint job! Added by Squad546 on 21 January 2012. It seems that buying a double cab pickup with a utility box on the back might also be mainly a budget decision, as this would be a fraction of the cost of a new - or even second hand - Pierce custom rescue. Added by Rob Johnson on 08 November 2018.